CS101 is currently between terms. Check back soon for the next start dates, or email us at info@cuecollege.org. Learn to cue with an instructor! Available with 1.5 RID Professional Studies CEUs! 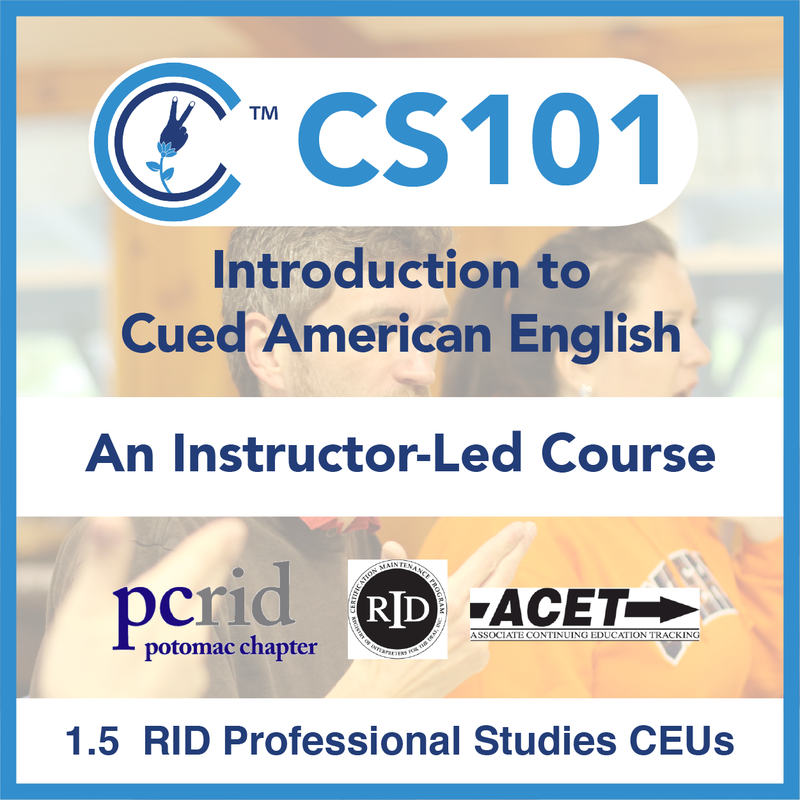 CS101 includes 14 lessons that teach the hand shapes and hand placements of Cued American English with video demonstrations and practice activities for expressive cueing. CS101 also includes instructor interaction, quiz checkpoints and an RID course evaluation that you must complete in order to receive credit for the course. This course will be available from January 21, 2018, to April 1, 2018. Upon purchase of the course, you will receive an email confirmation of your registration with instructions for signing onto our Canvas Learning Managament System. Your course will appear in your Canvas dashboard on January 21. Upon successful completion of the course, your CEUs will be reported to RID within 10 days of the end of the course. Now available with 1.5 RID Professional Studies CEUs! CS101 takes you through the foundations and mechanics of Cued Speech, with examples of different words cued at each hand placement with each hand shape. 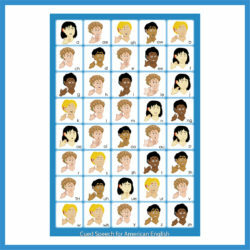 Along with an introduction lesson, there are fourteen lessons that cover the phonemes corresponding with each hand shape and hand placement. Each of those lessons include videos that you can watch while practicing your cueing. The instructor will lead you through the introduction and fourteen lessons through recorded videos. Office hours also will be offered for those looking to get feedback. This course is only the first step in gaining fluency and building your understanding of the mechanics and principles of Cued Speech. 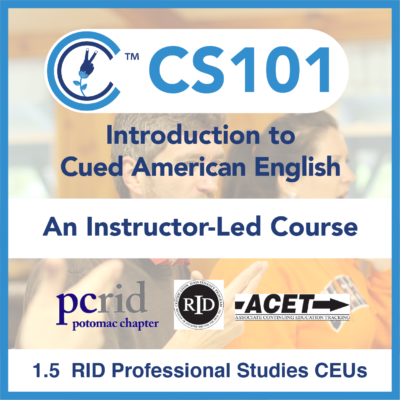 At the end of this course, you will learn more about the next steps in building fluency in Cued American English as well as opportunities to make connections within the Cued Speech community. Students will be led to create an account in Canvas, the e-learning platform. Instruction videos, written explanation and instruction, and demonstration videos will all be accessed through Canvas. Hearing and Deaf interpreters, students, educators, and other professionals. Parents are welcome. None to some/little prior content knowledge is required to participate in this workshop. Claire Klossner, NIC learned how to cue when she was 7 years old. She has taught cueing classes and Cued Language Transliterating classes all over the country for the past 20 years. She currently works as a freelance ASL-English Interpreter and Cued Language Transliterator in the Washington, DC area and is the Secretary of the National Cued Speech Association. 1. 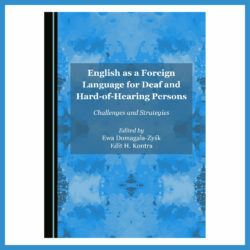 Describe the purpose and the philosophy behind the invention of Cued Speech for language acquisition and literacy with people who are deaf of hard-of-hearing. 4. 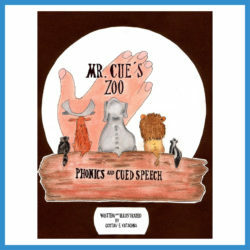 Demonstrate the ability to cue words and short phrases in English through Cued Speech.